Once again, Eton has read our minds and brought us yet another useful mobile gadget: the Mobius solar charging case. 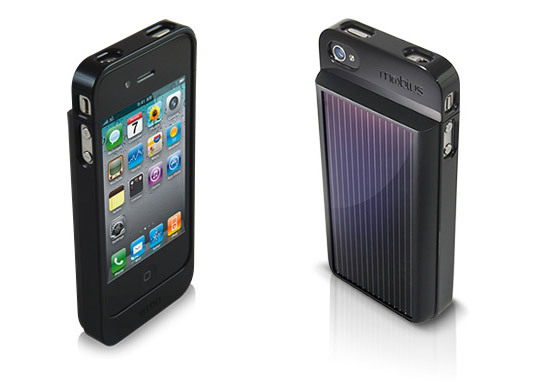 Like the company’s other electronics, the Mobius is equipped with a monocrystal solar panel that gathers the sun’s energy and turns it into juice for your iPhone. With a battery built into the case, this clever gizmo increases your iPhone‘s talk and play time by a factor of 2, even when there isn’t a single solar ray to be seen. We’re also digging the fact that this case doesn’t turn your iPhone into a brick! Once again, Eton has read our minds and brought us yet another useful mobile gadget: the Mobius solar charging case. Like the company's other electronics, the Mobius is equipped with a monocrystal solar panel that gathers the sun's energy and turns it into juice for your iPhone. With a battery built into the case, this clever gizmo increases your iPhone's talk and play time by a factor of 2, even when there isn't a single solar ray to be seen. We're also digging the fact that this case doesn't turn your iPhone into a brick!